eProcess Gas Liquid Cyclones (GLC) and Axial Flow Cyclones (AFC) provide cost effective, compact, and efficient gas-liquid separation. 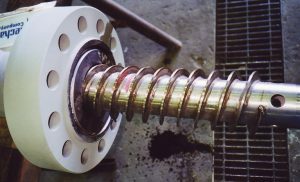 GLC’s are used either eternal or internal to production separators, whereas AFC’s are only used externally. Multiphase fluids enter the top of a GLC tangentially and rotate from the action of centrifugal forces. The heavier liquids are forced to the wall of the cyclone and travel down to the underflow outlet, while the lighter gas phase migrates to a central core to exit the overflow. Multiphase fluids enter the base of an AFC and rotate from the action of centrifugal forces. Stationary helical vanes force the heavier liquids to the wall of the cyclone and the lighter gas phase migrates to the center. Dry gas is separated and directed to the outlet stream while the remaining partially degassed multiphase stream continues axially through the separator. In Topsides applications the separated gas phase will be recovered via an elbow or crossover line, whereas Downhole the dry gas will be directed to the tubing-casing annulus.